Daniel Burwasser is a GRAMMY Music Educator Award nominee. He has been teaching music in the New York City public schools for the past 30 years. 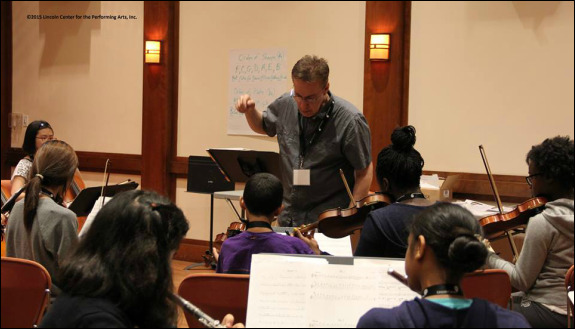 He is currently director of instrumental music at Talent Unlimited High School in New York City where he teaches and directs four large instrumental ensembles. He is also Principal Director of the New York All - City Jazz Ensemble which serves some of the most talented students from all 5 boroughs of NYC. Conducting the Talent Unlimited Concert Band, 2014. Dr. Burwasser is Principal Conductor of the All-City Jazz Ensemble. For information on the program, click the link above. Directing a dress rehearsal of the New York All-City Jazz Ensemble. Dr. Burwasser is an Adjunct Professor in the Department of Music at Hunter College. He teaches courses in percussion, piano, world music, and instrumental teaching methods. Click the image above for more information about the program. Directing the Kent County, Delaware Honors Symphonic Band, February 2015. Teaching rising NYC public school 8th graders in the NYCDOE/Lincoln Center Middle School Arts Bootcamp. Dr. Burwasser directing the MEANYC All County High School Honors Jazz Ensemble, 2017.